Much to the chagrin of the opposition dictatorship, Nkosana Moyo predicted, well before the elections, that a President Emmerson Mnangagwa would do things, (not necessarily well), but certainly differently from Robert Mugabe. 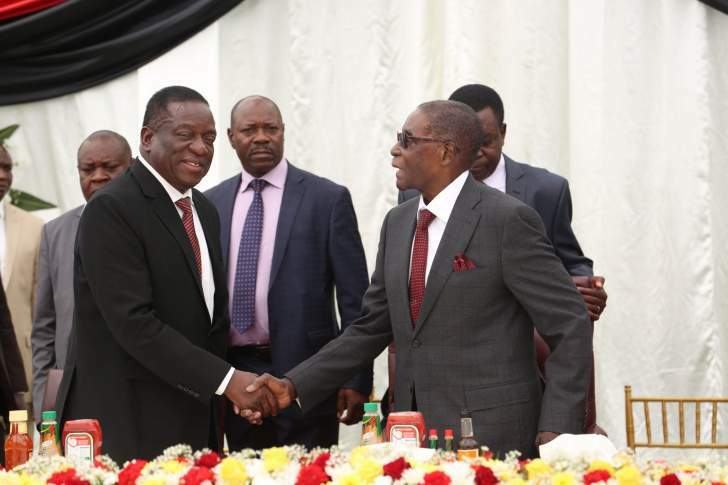 The fervent attempts by Mnangagwa to disentangle himself from the divisive leadership and polarised, toxic governance culture of the Mugabe brand of politics, and in its place, to rekindle and rally the diverse national energies around the requisite collective psyche of nationhood and a commonly cherished national destiny and shared agenda is as plausible to many as it is baffling to others. Twelve months beyond Mugabe, the endeavour at change seems to have built as many bridges as it may have destroyed. Granted, a couple of heads may roll, few hornet nests seem to be ruffling and there is a beguiling, if only hopeful sense of refreshed disdain with governance graft and some trappings of the old way, accompanied by an encouraging perception of changed thinking and action. But the alternative narrative, that a potential cosmetic bluff and the effective retention of the fundamental architecture that is ultimately responsible for poisoning our politics and ruining both the economy and social fabric of our society, is what we are experiencing over again, may be difficult to ignore. Like every other pained Zimbabwean, I remain on my knees, in earnest prayer that God may grant great wisdom and divine foresight to our leaders that they may, perchance, command the good hearts, competence and sincerity to deliver our crest-fallen and sunken nation to Canaan! But no sooner do I rise from that sincere prayer, am I hit by that unmistakable sinking feeling that our desperate resort to collective prayer, over the past 38 years, is less an indicator of our faith in God as it is of our dereliction of duty as responsible citizens with a consistent governance challenge and 13 million brains. Ours is a challenge not so much of bad leadership, but more of lazy and irresponsible citizenship. And that perhaps, shouldn't be God's business! It is difficult to quarrel with Moyo's compelling observation yesterday that in the final analysis, it is a false notion that Zimbabwean citizens have suffered enough and feel and share some great sense of deprivation, poverty and a collective desire for change. Rather, he points out, Zimbabwean citizens, both the purporting opposition and the politically neutral, are not fighting the system of governance with any real desire to uproot it and replace it with another, better suited for their needs. They are all stampeding, in a frothing foul system of patronage, to be included in and to derive personal benefits from the system. None has any real commitment to a concerted effort to change in fundamental ways the whole approach and architecture of governance, in spite of what they say and call themselves. The good lot simply want to join in the loot and gravy-train and name the train in rebranded nomenclature, whilst the avowed position only envy the trappings of power and the limitless access it accords to the one that wields it. Their greatest ambition is simply to displace and replace Zanu PF, but to retain hook, line and sinker the very governance system they purport to detest. The Mugabe-must-go crusade, both out and inside of Zanu PF has always been driven by a refusal to see the malignant cancer replete in the fundamental bowels and veins of the party and the utterly misplaced notion that the consummate problem of Zanu PF and government, and Zimbabwe, is the person of Mugabe. It has always been an attempt to treat an abdominal ulcer with pain-stop for the headache that it occasions! It is an attempt to improve the performance of a dead horse by changing the horse-rider. The relentless endeavour to find and pump new financing and resource inflows into our moribund economy is both welcome and inevitable. However, that effort too, if premised on the false notion that our ultimate challenge is lack of money or foreign currency and resources, is an effort in futility, it is an effort akin to feeding a dead horse. For, in an inherently corrupt and deliberately leaky resource envelope and looters haven such as ours, no amount of resources can be contained and managed and effectively accounted for. If in a blink, your pockets can leak $15 billion, why and how would the injection of fresh plane-loads of forex make a difference? It is commendable indeed that the President had the great wisdom to look beyond his internal deadwood and rope in some of Zimbabwe's best economic brains to clean up this mess. But Mthuli Ncube, Kirsty Coventry and all the exciting new brooms necessarily work within a defined context. The initial rumblings of dismay, disapproval and outright anger erupting from the protected nest of looters suggest that Ncube and all his competent and well-intended interventions may be up against real political pushback, hostile resistance and a potential stillbirth. A dead horse can't be improved by the greatest of horse riders alive. Our pain and our poverty as citizens are all figments of our creative imagination. In government truth and statecertified reality, we are rich and happy citizens in a wealthy and thriving economy. What, in reality, is a dead horse has been resurrected in our minds as the living-impaired; our newly rebased economy woke up so much bigger and healthier than our empty stomachs fool us. While buoyant economies around us are struggling to attain a growth as humble as 3%, the Zimbabwean economy anticipates some 7% growth manje-manje! When the headmaster's son struggled with real competition in his class, the school head would reshuffle classes and class names from grades to colours. His son would soon find himself competing with the slowest learners in the school to enable him to retain consistently the class top performer award. There is a conscious attempt to lower the barometer of performance of the economy to sell the impression that the laggards are superstars. The great patriot inside of me will ever seek the silver lining of all our clouds. It is not in doubt that Mnangagwa has little choice but to act differently and seek to be the messiah Zimbabweans are looking for. But it not in doubt, too, that Zimbabwean citizens are lazy opportunists that hope for a joyride in a governance system they are unwilling to graft and sweat for. Neither is it in doubt that perhaps what the horse citizens have been flogging for decades is, in fact, a dead horse.